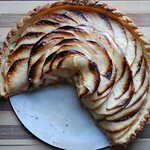 We had one last tart class before embarking on some breads, and it was my favourite tart class so far. In the demonstration, it was a little bit chaotic despite the fact that we had our favourite teaching chef, the young one, showing us everything. 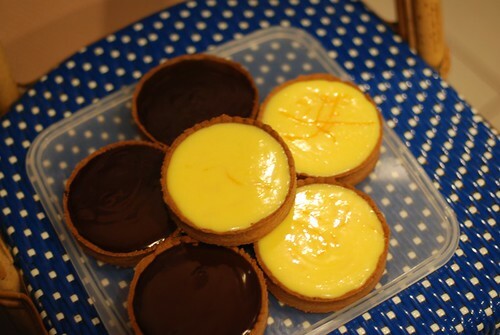 He had to make the chocolate tartlets and orange tartlets we were going to attempt in our practical class, plus lemon tartlets, pear tartlets with almond cream, almondine tartlets, and brittany tartlets with apricots – all in large quantities for the class to sample. He also had to work “logically” (one of his favourite words), so he was constantly switching back and forth between different recipes, which made it very difficult to keep our notes straight for each recipe. I had a little break for lunch before going into the practical, and my thoughts were all over the place about how to organize myself. (Remember, I’m the person who writes down steps like “weigh out flour in large stainless steel bowl, then put it down and go melt your butter”.) We had the chef who’s responsible for Superior Pastry classes, so I was a little nervous to see him in the classroom observing us, a bunch of beginners. He spent the whole class telling us to hurry up. He said it in English, in French in many different ways, and even in Spanish to one of the girls in my class. 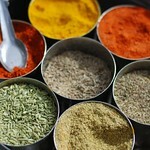 The chef was also helpful, though. He’d tip the mixing bowl for me when I scraped, drop off a spatula if someone needed one, or pick up a used bowl on his way to the sink. 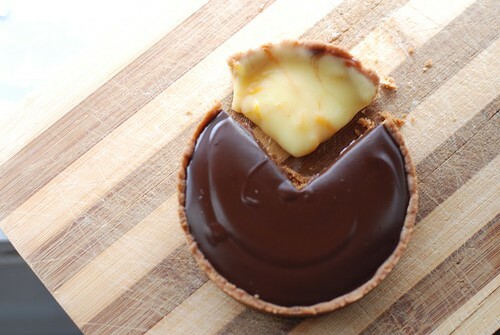 I made a blunder early on by not sharing a baking sheet with another student when I made the soft chocolate centre for the chocolate tartlets, and he questioned me on it, which totally flustered me. I apologized and attempted to move my parchment around a bit to find another person to share with me, but he waved me off…though not before he scrutinized my name tag from very far away (he’s clearly in need of some glasses) and made a mental note. Bah. Tartlets in the locker room – I left 4/6 behind, for the sake of my health and waistline. The chocolate tartlets had a layer of “soft chocolate” which is like a non-gooey version of a chocolate lava cake. Then it was topped with lovely shiny ganache glaze that not only had the usual suspects (cream and chocolate), but also honey and butter, which made it that much more delicious. The only weird thing I noticed about these tartlets is that I think the school’s cocoa powder tasted a little alkaline for some reason, so the chocolate layer was a little tinny when I tried it on its own. Combined with the ganache, and the crunchy almost cookie-like tart shell, it was divine. I had fun making the little tartlets because I was looking forward to the end products. However, these little babies were very labour-intensive, so it was also one of the busiest practical classes yet! In the midst of it all, one of my classmates reminded me that I’m going to be repeating this hectic-ness for many days to come, since we’re only at the beginning of my diploma program. Oy vey! Oh! 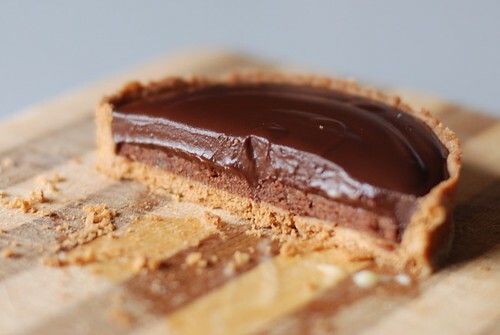 That chocolate tart looks incredible! 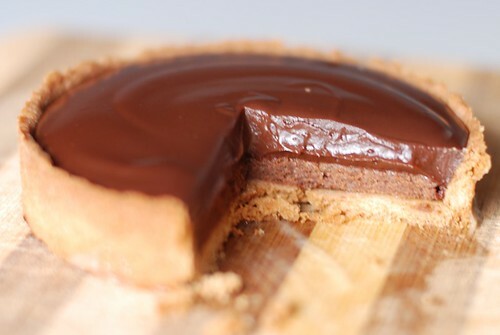 It was such a genius invention of a chocolate tart – the two layers thing was key!